For such a lowly fell (803 ft in old money) the views are out of all proportion to the effort required to reach it. Having said that, my route of approach from the Bowness ferry via lots of rough paths and clear-felled forest felt tough enough. And what a splendid monument! 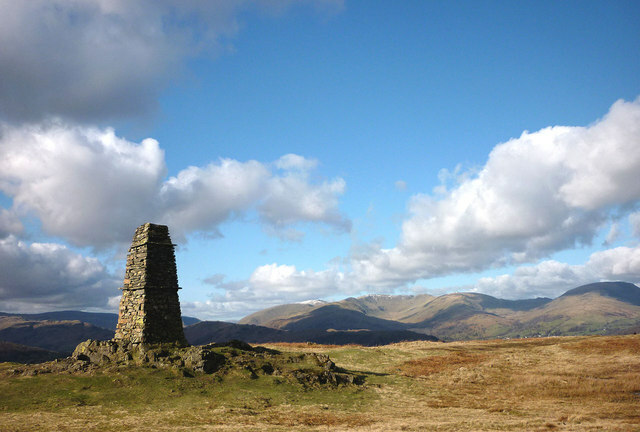 It could be argued that this is the finest summit cairn in the Lake District - the only other contenders that come to my mind are Thornthwaite Crag Link and Hallin Fell Link To the north the view is towards the Fairfield range. I see this view from my front room window. The sun comes up just over the summit. and sets behind hind us over Tarn Hows. Lovely.